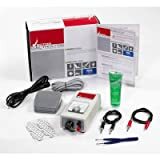 The Vector® System uses the process of electrolysis to permanently remove hair, unlike other battery operated radio frequency devices (such as Igia®) sold on infomercials. Offers the same results as professional electrolysis, but without the use of a needle. Very easy to use, simply grasp the hair with the tweezers and after a few seconds a chemical reaction occurs in the hair shaft and causes the hair follicle to dissolve and loose it ability to grow hair. The hair that was treated is permanently removed. A meter on the front panel shows exactly how much power is being applied during treatment. If you have embarrassing unwanted hair, you can now get rid of it permanently in the privacy of your own home. The Vector Hair Removal System is the only medical grade electrolysis device available to the consumer. Here is How It Works: An electrode patch is placed anywhere on the body (this patch is used instead of the metal rod used during conventional electrolysis for better comfort during treatment). This patch is then connected to the ground wire and plugged into the Vector. The second wire is plugged into the tweezers. The supplied conductivity gel is coated over the hair (the conductivity gel allows hair above the surface of the skin to conduct electricity, without the conductivity gel the hair has a very high resistance and will not conduct electricity even at lethal voltages) and that hair is then grasped with the tweezers as close as possible to the skin without actually touching the skin. The current will flow from the tweezers down into the hair follicle, causing the watery environment inside the hair follicle to react with salt, resulting in Sodium Hydroxide. This chemical process is what dissolves the hair follicle and therefore the hair will never grow again. Unlike waxing, shaving, or tweezing each hair treated by the Vector System is permanently removed and will never grow back.